The DP80 Series series has been discontinued. Please see the Platinum Series Meters as a possible alternative. Some stock may still be available as shown in the "To Order" section. DP80 Series digital indicators offer complete expandability to effectively meet your changing needs. A custom designed, integrating voltage-to-frequency A/D converter combined with precision filtering, isolated electronics, and multi-segment digital linearizations lets the DP80 Series accommodate wide measuring ranges at a very high resolution - high enough to achieve laboratory accuracy in process and test measurements. The DP80 Series offer repeatability, reliability, and compatibility with most sensors. 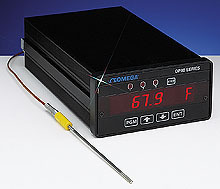 Temperature can be measured from -273 to 2318°C (-460 to 4206°F), or 0 to 2592 k, all with 0.1° resolution. DC voltage can be measured to 1 µV and ranges are available up to 100 V. Process voltage and current loops can easily be scaled from the front panel, within 99999 display counts. Strain-gage indicators measure load cells, pressure, torque, thrust, and force with 0.01% precision. Whether you’re measuring the temperature of molten metal or testing jet engine performance, make your choice a DP80 Series digital indicator.